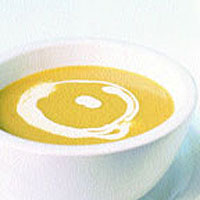 This intriguing, pale mustard-coloured soup has a fresh, clean flavour and background hint of curry and lemon. Melt the butter in a large, heavy-bottomed pan over a medium heat. Stir in the onion. Season lightly with salt and cook gently for 10-15 minutes until soft. Meanwhile, squeeze most of the lemon juice into a bowl. Peel, core and chop the apples, stirring them into the lemon juice. Stir the curry powder into the onion and cook, stirring, for 2 minutes. Add the stock and apples and bring to the boil. Reduce the heat slightly, cover and cook for 30 minutes or until the apples are soft. Liquidise and pour through a sieve into a bowl. Cool and then chill. Stir in most of the cream and adjust the seasoning with salt and lemon juice. Pour through the sieve again, into a serving dish. Chill until required then decorate with the remaining cream and mint (if you like) before serving.